Recreational boating traces back hundreds of years, but only in the past decade has copper antifouling paint covering a boat’s hull become a significant issue. The Environmental Protection Agency (EPA) has been actively regulating water quality since the 1990s. However, only recently have local and state officials begun considering restrictions on allowable levels of dissolved copper in waterways often frequented by recreational boaters. Goals to reduce copper levels in the nation’s waterways vary from marina to marina, with each region facing unique environmental issues and challenges. In a majority of cases, regional and local agencies will develop, govern and administer regulations called Total Maximum Daily Loads, or TMDLs, to prioritize cleaning waterways too polluted to meet water quality guidelines established at the state level. The EPA sometimes establishes a TMDL to help upgrade water quality for a specific waterway. In California alone, the EPA has completed TMDLs at 34 bodies of water, including portions of Long Beach city beaches, Los Angeles River, Malibu Creek, Oxnard Drain, San Diego Creek and Santa Monica Bay. Los Angeles County officials enacted a policy last year seeking to reduce the amount of copper entering Marina del Rey by 85 percent by 2024. In order to achieve that goal, boaters at the county’s largest recreational boat harbor would have to use low-copper or copper-free paints on their respective vessels. At least one person questions whether Marina del Rey will meet the ambitious goal set by the Los Angeles Regional Water Quality Control Board. Making a presentation at the 2015 California Marina Affairs and Navigation Conference (CMANC) in Long Beach, California, last month, Michael Tripp of the Los Angeles County Department of Beaches and Harbors said time and money pose significant challenges to reducing copper sediment in Marina del Rey by 85 percent within the next decade. “Reducing copper from boats can be achieved by repainting boats that currently have copper on their hulls with a nontoxic paint. However, this is an expensive process and not typically part of the hull repainting regimen of most boaters. The application of nontoxic paints requires that the existing copper hull paint be stripped,” Tripp said. Marina del Rey’s size and design also might pose logistical issues to meeting the county’s goal. Specifically, Tripp pointed out Marina del Rey, home to 4,701 slips but only two boatyards, has a 17 percent vacancy rate. The two boatyards would be able to strip and repaint about 150 boats per year. “Our two boatyards have indicated that together they can strip and repaint approximately 150 boats a year, in addition to their everyday business. 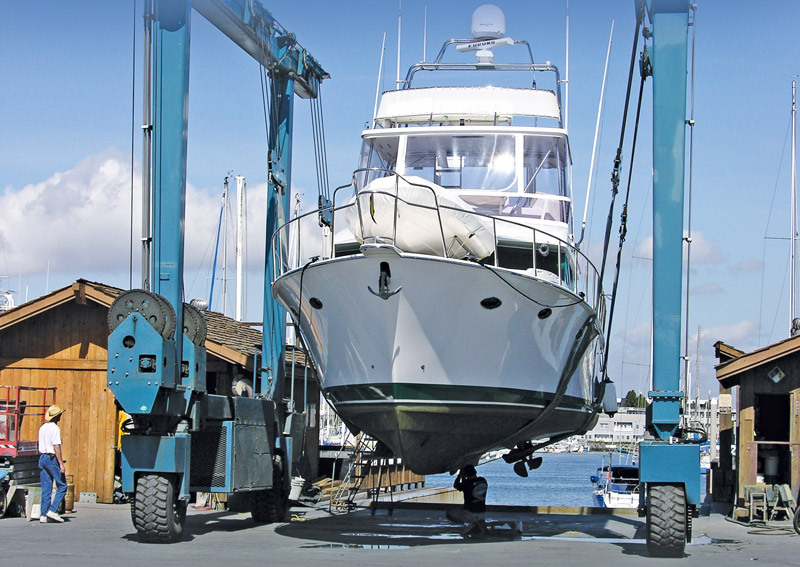 Given there are approximately 4,700 slips in Marina del Rey, stripping and repainting enough boats with non-toxic paints that will reduce the copper discharge by 85 percent by 2024 is not achievable,” Tripp said. He added time and money are significant issues but not the only factors in attempting to meet state and county goals. “Based on boater and boatyard comments, it appears there are concerns about the cost-effectiveness and efficacy of nontoxic and non-copper paints,” Tripp said. “It has been estimated that an MdR boater will need to spend an additional $7,000 to repaint a 35-foot boat with products that aren’t established in the marketplace. This is a challenge when copper-based paint is still legal to use. “Also, the boatyards may need to purchase new equipment to be able to apply the non-copper paints,” Tripp continued. Nonetheless, several environmental groups have been advocating for TMDL regulations at Marina del Rey and other harbors in California. According to Heal the Bay, there are at least 57 TMDLs regulated om more than 175 waterways. One of those waterways is the section of San Diego Bay that is home to Shelter Island, an area identified as having copper levels exceeding federal and state standards. In 2005, Port of San Diego officials were given 17 years to reduce copper levels in San Diego Bay’s marinas, port berths and yacht clubs by 76 percent by 2022. To help meet that goal, the Port of San Diego created a hull paint conversion project and held several expos in an attempt to educate boaters about alternatives to copper. Shelter Island was tasked with meeting the San Diego Regional Water Quality Control Board’s interim TMDL target to reduce copper by 10 percent. According to the Port of San Diego, that goal was met in 2013. Interestingly enough, Tripp said in his CMANC presentation that some boaters are resorting back to copper-based paints. In August 2014, the executive officers of the Los Angeles and Santa Ana regional water quality control boards co-wrote a letter to the environmental monitoring branch of the Department of Pesticide Regulation, stating stakeholders in Marina del Rey and Newport Bay had “widespread misunderstanding” of regulations to meet water quality standards. At least one group thinks the regulation of copper paint in Marina del Rey will ultimately push boaters away from the harbor. “With increased regulation onto boat owners, this harbor will become a far less viable option for owners who will have no choice but to select a more affordable harbor. The impact of this harbor flight will be not only to the detriment of the boating community, but also Marina del Rey at large, whose budget relies heavily on the marine industry,” LAX Coastal Chamber of Commerce President Christina V. Davis wrote in an opposition letter to the Water Quality Control Board last year. She added plans to reduce copper discharge from boats by 85 percent by 2025 lack practicality. “The plan to reduce copper discharge from boats by 85 percent over the next 11 years is great in theory, yet its arbitrary limits set on copper, lead, zinc, PCBs and DDT, among other substances have little factual basis,” she wrote. Davis also said the Los Angeles Regional Water Quality Control Board’s proposed alternatives were limited in scope. Alternatives to those nontoxic bottom paints are not economically viable for boaters, Davis added. “The closest alternatives last only eight to 12 months and cannot be applied over copper-based paints. Most notable among consequences of this alternative is the roughly $8,000 cost onto the owner for stripping the paint and then applying a new coat of less effective antifouling agent,” she said. Boaters are not the only ones bearing the cost of attempting to remove copper from the waters of Marina del Rey. According to Tripp, Los Angeles County will have to spend about $200 million in order to meet the Regional Water Quality Board’s requirements by 2029. Tripp added the county invested more than $32 million to improve Marina del Rey’s water quality and another $6 million to study and monitor water and sediment in the harbor between 2006 and 2016. “The requirements placed on Marina del Rey will be incredibly difficult to comply with in the timeframe given, and will place a great cost burden on the marina’s boaters. It will also hurt the competiveness of Marina del Rey, as it will be the only harbor in the area where the use of a legal and effective product is restricted,” Tripp said. With so much money invested in Marina del Rey alone and several entities or public officials advocating for boaters to seek non-copper alternatives, an interesting question is raised: Who benefits from the amount of money spent on stripping hulls, monitoring water quality and cleaning harbors? Boaters in San Diego and Newport Harbor were offered “free money” to change their hull paint. Orange County Coastkeeper, for example, partnered with the city of Newport Beach to promote the Newport Bay Copper Reduction Program between 2009 and 2012. The voluntary program was deemed unsuccessful, with only 10 boats converting from copper to non-copper paint. After the program failed, the Santa Ana Regional Water Quality Control Board began studying how to implement a compliance plan to reduce copper levels in Newport Bay. According to Orange County Coastkeeper, a preliminary report on the implementation plan was supposed to be made public by the end of 2014. However, as of press time, the report does not appear to be available on the Santa Ana Regional Water Quality Control Board website. A county-funded report studying the water quality at Marina del Rey could be made available in 2016. According to another presentation made at CMANC last month by Hoan Tang of Los Angeles County’s public works department, copper sediment in Marina del Rey will be studied later this year and through 2016. Preliminary results are expected to be made available in late 2016. Ventura County officials are also conducting water quality studies, according to a recent presentation made by Ewelina Mutkowska, the county’s stormwater program manager. A study submitted from Orange County Coastkeeper to the Santa Ana Regional Water Quality Control Board in March 2014 revealed copper levels in Newport Bay exceeded guidelines near marina sites such as Harbor Marina, Lido Village, Lido Yacht Anchorage and Balboa Island Channel. However, the report stated additional studies must be conducted to determine if the copper sediments are toxic to living organisms. Until the studies are complete, The Log will continue looking into TMDL requirements, report on the impacts of copper paint in local harbors and analyze the financial aspects involving antifouling and copper regulation.